Ever dreamt of talking to a sea turtle? 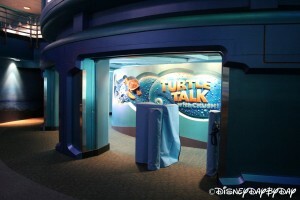 Okay, maybe not, but in Turtle Talk with Crush you’ll be able to do just that. This is a sit-down attraction where you’ll head into a small room for a good fifteen minutes. The best part is listening to the hilarious questions and answers as children talk to Crush! Okay, not the real Crush, he is a cartoon after all. This Crush appears on a screen that makes it look like he is in an aquarium. But don’t worry, through the magic of Disney Crush can see and talk to you! Even better, you can talk back. Children are welcome to sit on the carpeting up front and ask Crush questions, while parents can relax on benches! Tip: Turtle Talk is in the same building as The Seas with Nemo. Make sure to factor in time to do both attractions as well as exploring The Seas with Nemo and Friends Pavilion (a real aquarium where you can see Manatees, Dolphins and a variety of other ocean animals). Kids love the interaction with Crush and there are definitely some funny moments for the whole family.